Attend and participate in their program area and board meetings. Implement conference planning procedures as specified in the CSSP Policy and Procedures Manual. Attend monthly meetings with other organizational sponsors. Select the CSSP sponsored speaker and make all arrangements regarding topic, travel, etc. Recruit and make arrangements for conference volunteers. Assist with “stuffing packets” and arrange for other volunteers. Write an article regarding the conference for the CSSP newsletter. Serve as monitor and contact person for school psychology students and practitioners who have <3 years of experience in the field of school psychology. Add new names to the email list/ listserv (via communication with the Technology Chairperson or Webmaster) as needed. Serve as the scholarship silent auction chair, coordinate the auction, and manage student representatives as part of the auction team. Work closely with membership chair in recruiting new members. Act as a liaison between students in their training program and CSSP for the purpose of receiving support, identifying issues and integrating into the profession of school psychology. Create a list (with contact information including email addresses) of all students in their school psychology training program. Provide above list to Technology Chairperson and/or webmaster for creation of a listserv. Monitor the listserv regularly and bring forward issues identified by individuals on the listserv. Assist as a volunteer at CSSP’s fall conference. Serve on the scholarship silent auction team which is chaired by the Student/New Practitioner Representative, and work as support staff for all areas needed for the auction (raffle tickets, set up, etc.). Create a written document outlining the opportunities and process for nominating and electing CSSP’s officers. Provide the above document to the Publications Chairperson for inclusion in newsletter prior to elections. Select committee members to assist in carrying out the necessary tasks of the committee. Announce nomination procedures at the annual conference, publish them in the newsletter immediately preceding the nominations/elections deadlines, list them on the association website and email members. Collect statements created by the candidates related to their qualifications and backgrounds. Work with the Publications chairperson to coordinate the dissemination of information about the candidate if publication deadlines coincide with nomination and election deadlines. A secured online voting system will be designated as the primary system with direct mail serving as an alternative ballot mode should conditions necessitate. Open ballots with the president-elect (or appointee) after the deadline. Present the proposed slate of officers to the Executive Council via email. Announce the results of elections to the membership via listserv and website. Coordinate all activities related to the Declaration of School Psychology Week. 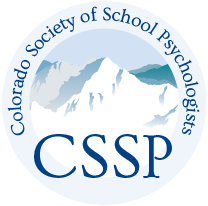 Solicit nominations for and facilitate selection of Colorado School Psychologist of the Year and other awards presented by CSSP. Coordinate submission of School Psychologist of Year candidate paperwork for NASP School Psychologist of the Year. Work with conference committee regarding public relations information and/or items to be distributed at conference as well as the presentation of the School Psychologist of the Year award.